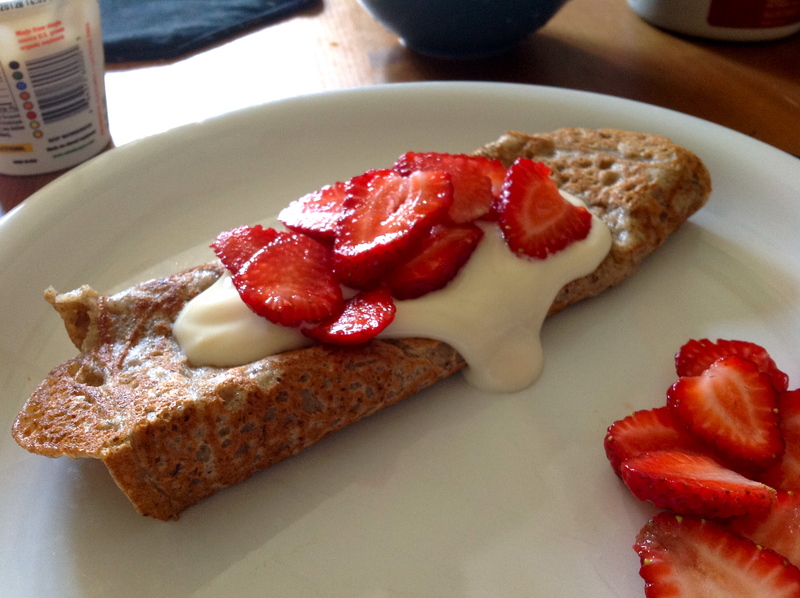 A Perfect Breakfast for Summer Solstice… Banana Flax Crepes with Strawberries!!! I love this time of year!! It’s when I get to go the Farmer’s Market and always have super fresh delicious produce. Today even when I first woke up (before 6am) it was already a sunny gorgeous day at the beach! How lucky I am to be here. Last night before falling asleep I was dreaming of what I wanted to make for breakfast and it came to me… crepes!! Topped with lots of fresh strawberries! YUM… no wonder I woke up so early excited to make a scrumptious meal. Grind whole flax seeds into meal and add to GF flour. Mash up ripe banana before adding to powdered ingredients. Then add vanilla, salt and water. Start with a small amount of water and work your way up to desired consistency. You will have to add more water than you think because the flax will just keep soaking up that water. Heat a skillet to medium heat and add some coconut oil to coat the pan. Then pour some of the mixture in and spread out in a circle as thin as possible. No need to flip… the crepe is done when you can tell there is no raw dough on the surface. Then top with soy yogurt and fresh berries… Enjoy!!! Holy Cow these are the freakin bomb!!!! Thanks so much! I’m glad you liked them as much as I did!